The Reksten Collections is an art and cultural centre located at Fjøsanger in Bergen just off the royal family’s residence, Gamlehaugen. The collections were built during the period of the 1960s and 70s by the shipping magnata and philantrophist Hilmar Reksten and was to be a home of the arts. The venues consist of a museum building with several rooms and halls: the Pentagon, Hetland hall, Silver hall, Ekhaug and the Hilmar Reksten room, in addition to Hilmar Reksten’s former private residence, the Villa. 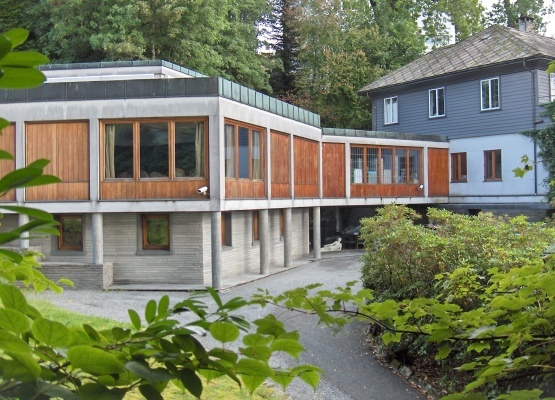 The musuem’s four single bedsits and one apartment offers accommodation or temporary accommodation for musicians, artists, students and cultural workers who need to stay in Bergen for shorter or longer periods. With art and instruments as a framework and inspiration the Reksten Collections want to contribute to the development and strengthening of the cultural life in Bergen through collaboration and facilitation.